It comes in the mail: the invitation to that boring party or wedding you have to attend. In fine print at the end of the invitation it reads ‘dress is business casual.’ Business casual, huh? You head straight to the closet and throw on your khaki shorts and flip flops. Good to go, right? When it comes to dress codes, do you know the difference? There are several different versions of business casual based on who you ask. Some people believe business casual means jeans and a polo. Others think it means khakis and dress shirt. Since we are more relaxed in the 21st century, business casual has changed over the years. Traditionally, business casual means ‘drop the tie’. In other words, business casual is wearing a full suit minus the tie. You could also argue that business casual could be a mock t-shirt underneath a blazer. 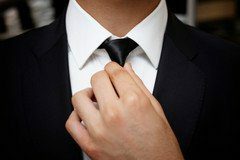 While khakis and a dress shirt is probably acceptable as business casual in most places, it’s best to be safe by going traditional. You may also be able to get away with wearing stringless dress shoes for business casual, as opposed to the more formal dress shoes. You can probably guess what business dress is. Business dress is wearing a full suit. Dress pants and a dress shirt do not count as business dress. Even a blazer would be considered business casual, not business dress. Formal dress shoes are also a must with business dress. No cheating! When it comes to the upscale events, it’s time to get dressed to the nines. By that, I mean wearing a tuxedo. A tuxedo is the true formal wear attire. And the highest level of formal events is a black tie event. You can certainly wear a long tie with your tux, but bow ties are coming back in style today. Don’t forget the patent leather tuxedo shoes too! You know, the shiny ones that are uncomfortable to wear.